London Fashion Week is in full swing and there is much there to celebrate (highlights coming soon). But, there is a lot about this “glamourous” industry that we don’t see - that the brands and stores don’t shout about in their marketing and PR campaigns. This season - the first fashion week since the Rana Plaza disaster in April which killed over 1100 garment workers in Bangladesh - I am more mindful about this than ever. As fashion and "trend" stories reach fever pitch in the press and on social media, I wanted to bring a little perspective by showing what goes on behind (some) closed doors in the global garment industry. 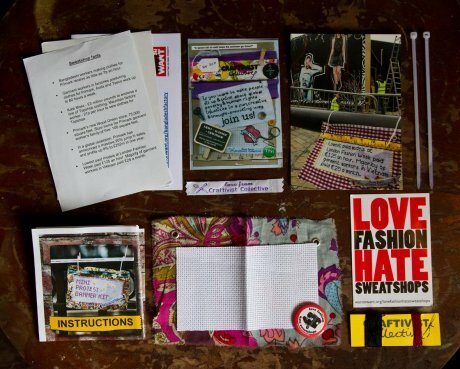 Craftivist Collective is a group of craft-loving activists who tackle social, environmental and human rights issues using a needle and thread. 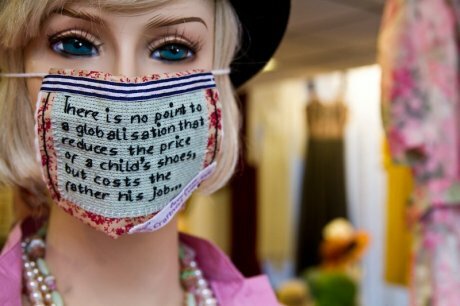 Founder Sarah Corbett teamed up with charity War on Want and their Love Fashion Hate Sweatshops campaign to launch #minifashionprotest in the run up to fashion week. Their aim, to highlight the dark side of the industry, is achieved subtly and poignantly with the imaginative use of tiny banners stitched with startling facts. In contrast to oft used giant slogans, the small-scale of each #minifashionprotest banner encourages an onlooker to get up close, stop for a moment and think, rather than simply walk on by. 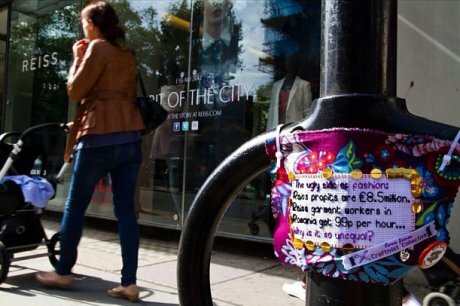 We’ll be writing more about the work of Craftivist Collective soon but for the time being here are a few images of their campaign. I hope they give you pause for thought – if so, please share them with friends. If you want to buy and make a banner of your own, please send photos of your banner in situ to Craftivist Collective by 1st October when the campaign officially comes to an end.